You are here: Home � All Deals , Home: Kitchen Grocery Furnishings � Create-a-treat Gingerbread House Kit, Deluxe Model for $19.97. A fun gift for Children in the Christmas Season. 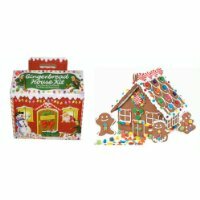 Create-a-treat Gingerbread House Kit, Deluxe Model for $19.97. A fun gift for Children in the Christmas Season. Amazon is selling a Create-a-treat Gingerbread House Kit with a decorative outer case for $19.97.This kit comes with 7 pieces of baked and pre-cut gingerbread pieces to construct one house. The set also includes 3 gingerbread cookie characters made up of 1 gingerbread snowman, 1 gingerbread kid, and one cookie pine tree. The set also has an easy build tray that helps children while building and cleanup, 1 bag of white pre-mixed icing, and lots of candy to cover the house. The set is in a decrative box, so in a sense it is already gift-wrapped. This offer is available for today only. Remember if you do not have Amazon prime you will need to spend a minimum of $25 to receive free shipping. Get this gingerbread house by clicking here.